This Genie Z45 only has 302 hours on the clock and is supplied re-sprayed, serviced and with new 6 month LOLER and 6-month warranty. With only 192 hours on the clock this Genie scissor lift is supplied with a new 6 month LOLER certificate and a 6 month warranty. This AWP36s DC has a working height of 13.10m and can pass through a standard doorway. Supplied with a 6 month warranty. Genie boom supplied with new 6-month LOLER and 6-month warranty, fully serviced, resprayed and tested. Supplied, fully re-sprayed, fully serviced, tested, inspected, with a new 6 month LOLER certificate and 6 month warranty. Used year 2006 Genie Z45/25J Bi Energy with only 919 hours on the clock. Supplied with new 6 month LOLER cert. and 6 month warranty. 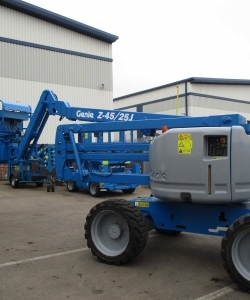 The indoor only Genie GS2632 has a 9.8m working height but is only 81cm wide. Supplied with a 6 month warranty and new 6 month LOLER certificate. Used 2007 Genie Z45/25J RT 4WD supplied re-sprayed, serviced and with a new 6 month LOLER and 6 month warranty. GS2668RT with foam filled rough terrain tyres and self levelling hydraulic outriggers. Supplied with a new 6 month LOLER and 6 month warranty. Used 2007 Genie GS3268RT with 2609 hours on the clock. Supplied re sprayed, serviced and with a 6 month warranty. Used 2007 GS3246 scissor lift with a 11.50m working height, 318kg lift capacity and 1.15m wide platform. 6 month warranty. The GS-2632 is only 81cm wide but can reach 9.80m. Supplied full re-sprayed, serviced, with a 6 month LOLER and 6 month warranty. This 2014 GS-2632 has just 122 hours on the clock, a 9.92m working height and 227kg lift capacity. Supplied with a 6 month warranty. 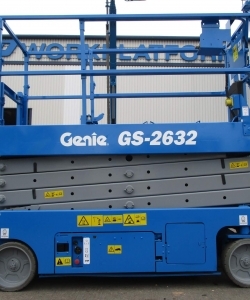 The Genie GS2032 is popular due to its slightly longer platform giving more room to 2 operators and its higher than normal lift capacity of 363kg. 6 month warranty.